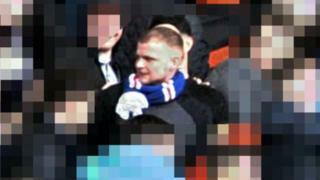 CCTV images have been released of a football fan police want to trace after a man was injured after a game between Aberdeen and Rangers. Police said the incident - which left a man with a head injury - happened shortly after the Scottish Cup fixture at Pittodrie on Sunday 3 March. Officers have issued images of a man they wish to speak to. He is described as being aged in his 20s, wearing a Rangers scarf and a black and grey jacket. He has short fair-coloured hair. PC Tom Bashforth said: "I would appeal to anyone who witnessed this incident or who recognises the man pictured to contact police." The game had ended in a 1-1 draw. Aberdeen then won the replay. A number of people were arrested at the original game, and there were reports of chairs being thrown. Aberdeen FC said thousands of pounds of damage was caused to seating in the away section of Pittodrie, and Rangers would be billed for the repairs.